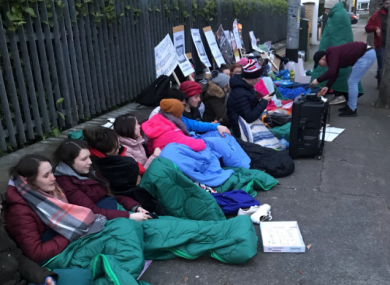 STUDENTS ARE STAGING a ‘sleep-out’ outside Dublin City University accommodation tonight in protest over a 27% increase in rents. Earlier today a group of students marched from DCU to Shanowen student residences in Santry to voice their concerns about the “extortionate” rent increases at the north Dublin accommodation complex. The 600 residents of the complex currently pay €7,000 for the academic year, however that figure is climbing to €9,000 starting next term. The students are sleeping rough outside the gates of Shanowen tonight with the president of the students’ union, Niall Behan, saying “If we cannot afford to sleep in Shanowen, we will sleep outside Shanowen”. Behan said the demonstrations are a response to Shanowen’s continued lack of engagement with the students’ union. “These prices have increased six times since opening and the rate has over doubled, but no improvements have been made,” he said. The campaign has gained 18,000 signatures on the petition, the support of the USI and every Students’ Union in the country and dozens of politicians and Irish influencers. DCU President Brian McCraith described the rent hikes as “unacceptable”. “The issue has the potential to limit the scale of future university investments and will inevitably result in increased rental costs for Irish and international students,” he added. The students’ union are calling for the total reversal of the increases and for the creation of legislation to protect students from being exploited. Shanowen Residences has yet to respond to TheJournal.ie‘s request for comment. Email “DCU students stage 'sleep-out' at accommodation complex over 27% hike in rent ”. Feedback on “DCU students stage 'sleep-out' at accommodation complex over 27% hike in rent ”.